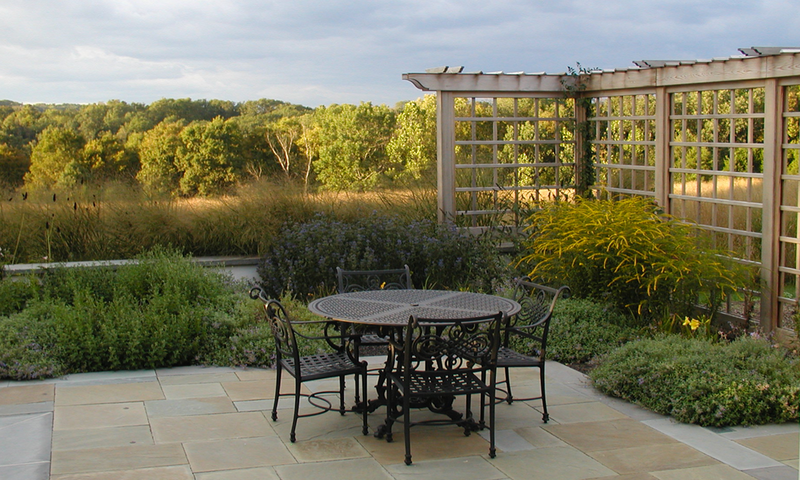 Addressing the clients' interest in preserving the open space of their property, the positioning of the driveway and fencing allowed the land to retain a natural feel, with the preservation affecting areas of fields, lawn, and meadows. The project team included Architect Lynn Taylor Associates, General Contractor Haberle General Contractors & Builders, Pool Contractor JMK Swimming Pools, Inc, and Landscape Contractor Indian Spring Landscape and Jerry Fritz Garden Design. Encompassing nearly 25 acres, this site includes both broad agricultural fields and a steep wooded ravine. The soils are thin and the deer browse problem is severe. At the high point of the site, near the entrance, distant views extend for miles. The entry drive, which is nearly a quarter mile long, takes full advantage of these distant views across lush meadows planted primarily with warm season grasses, such as Little Bluestem, Indian Grass, and Switch Grass. The drive terminates at a large turn-around, which forms the edge of an open play-lawn. The newly constructed home was sited at the juncture of the meadow and ravine, and out of the primary viewshed at the street. A row of larger trees, originally at the edge of the field, was allowed to remain in front of the house to provide scale and enclosure. A variety of under-story plants were added here, as well as in other wooded areas surrounding the house, to add seasonal interest and further define spaces. The swimming pool and spa were both sited in a protected area between the house and garage. A low masonry wall preserves views from the pool and family room, while maintaining the required pool enclosure. Both native and non-native plants were used, with resistance to deer damage being of critical importance. Pool Contractor: JMK Swimming Pools, Inc.